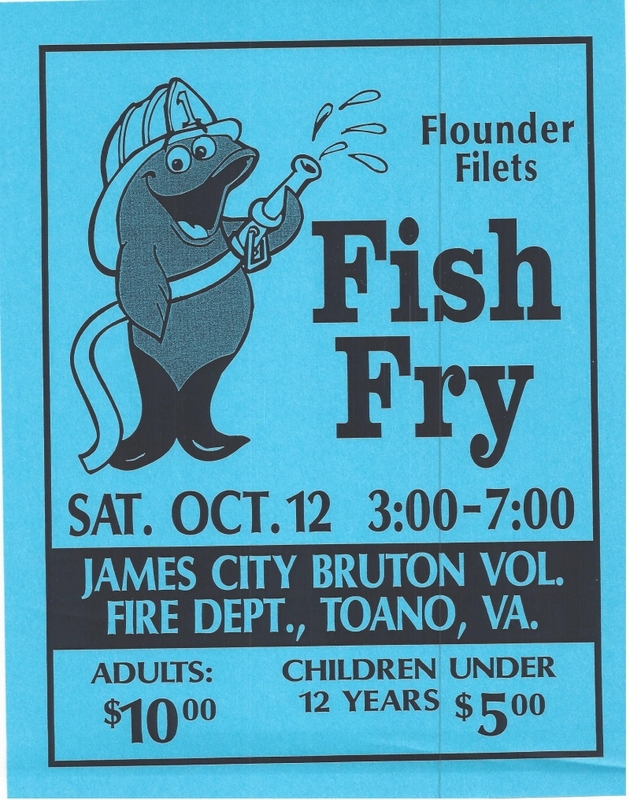 Thursday, October 10, 2013 The James City-Bruton Volunteer Fire Department and James City Volunteer Rescue Squad will host the Fall 2013 Fish Fry on Saturday, October 12, at Station 1 in Toano at the corner of Forge and Richmond Roads. Serving lines will open at 3:00 PM and remain open through 7:00 PM. Items will include fried flounder, cole slaw, hush puppies, baked beans, tea and soft drinks as well as various baked goods. The cost for plates is $10.00 for adults and $5.00 for children under 12 years. Be sure to stop by to enjoy great food, fellowship and information booths from various vendors and sponsors. James City-Bruton T-Shirts will also be available for purchase! Note: Parking for the event is free, and will be located at the Farmer’s Market across the street from JCBVFD as well as in the field on Forge Road just past the entrance to the station.